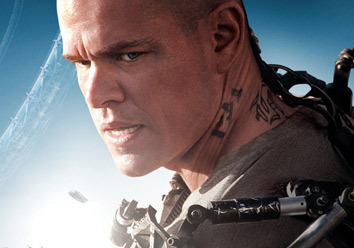 "Academy Award-winners Matt Damon and Jodie Foster headline the impressive cast of Columbia Pictures' new futuristic, action-thriller Elysium from District 9 director Neill Blomkamp. "Joining them are Sharlto Copley (The A-Team), William Fichtner (The Dark Knight), Diego Luna (Milk), Wagner Moura (Elite Squad) and Alice Braga (I Am Legend). "In the film which is set in 2154, two classes of people exist: the very wealthy, who live on a pristine man-made space station called Elysium, and the rest, who live on an overpopulated, ruined planet. The people of Earth are desperate to escape the crime and poverty that is now rampant throughout the land. The only man with the chance to bring equality to these worlds is Max (Damon), an ordinary guy in desperate need to get to Elysium. With his life hanging in the balance, he reluctantly takes on a dangerous mission—one that pits him against Elysium’s Secretary Delacourt (Foster) and her hard-line forces—but if he succeeds, he could save not only his own life, but millions of people on Earth as well. Sharlto Copley—Blomkamp’s childhood friend and the star of District 9—re-teams with the director to take on the pivotal and villainous role of Kruger. “He’s ex-Special Forces, now a gun-for-hire operative, a professional soldier who works on Earth for the elite of Elysium,” explains Blomkamp. "Opening across the Philippines on September 4, Elysium is distributed by Columbia Pictures, local office of Sony Pictures Releasing International."